There is a distinctive break made between the modern, sans-serif typeface of the word “Artist” and the classical serif typeface of the word “Empire” in the title/publicity material of the National Gallery Singapore’s reinterpretation of the 2015 Tate Modern’s exhibition “Artist and Empire”. The typographical split signifies a concurrent juxtaposition of a contemporary perspective and a historical perspective. While the Tate’s exhibition, whose full title was “Artist and Empire: Facing Britain’s Imperial Past” was interested in presenting a chronological display of historical artworks and ethnographic materials produced or procured during the Empire, the Gallery, with “Artist and Empire: (En)countering Colonial Legacies” sought to confront these “biographical” works with contemporary artists’ responses to Empire. With this approach, the Gallery hoped to argue against a monolithic re-presentation of British rule (retold by the British) – and to argue for dialectic and diversity of perspectives in our reading of what has been historically documented. Why present only those selective histories that have already been written by the victors, thereby continuing to reassert their power, when we can learn more about the complex legacy of the empire from those it disempowered? 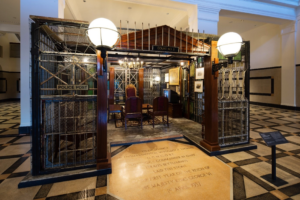 Compared to other former colonies, the imperial footprints left on Singapore may have been less deleterious, but asking that question certainly lays a meaningful foundation for a restaging of the exhibition. 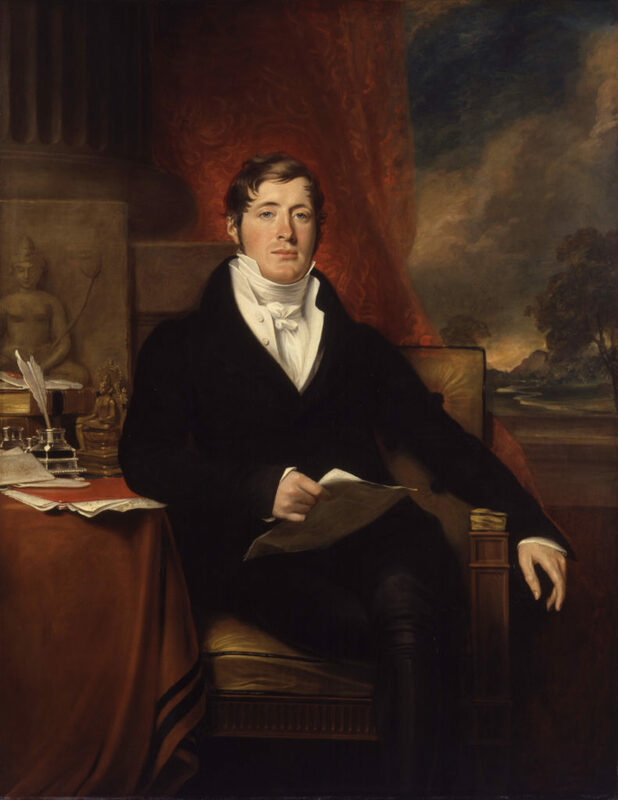 The show hence opens with British portraitist George Francis Joseph’s painting of Sir Stamford Raffles, founder of modern Singapore and a paragon of the empire’s influence in the region. The contemporary response to this work comes in the form of a large picture that stretches from ceiling to floor, as if to physically outsize everything Raffles’ figure represents, and an accompanying video, that together depict Singapore artist Lee Wen’s installation Untitled (Raffles) (2000). 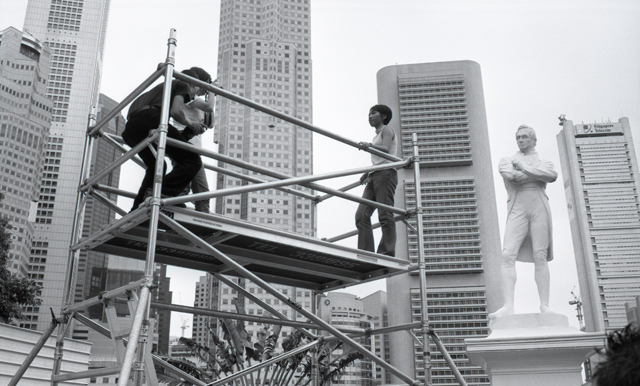 A heightened platform facing the sculpture of Raffles by the Singapore River was built, and members of the public were invited to get up and look the statue in the eye. In a sense it evokes the idea of confronting the empire on an even level, not as inferior. That’s the intended spirit set at the beginning of the exhibition: an equivocal presentation of contesting perspectives, and power dynamics between the coloniser and colonised. Lee Wen, ‘Untitled (Raffles)’, 2000, video, interactive site-specific installation as part of A.I.M. (Artists Investigating Monuments) project presented by The Artists Village on 22 July 2000 at Raffles. Video by Russell Miledge and Kai Lam Collection of National Gallery Singapore Resource Centre. In contrast, the Tate’s show did not aim to strike a balance between these, and this gave rise to much of the criticism against it. A public review states it “failed quite dramatically” in “conveying ideas about lived experience now or the impact of colonialism as played out in the world today”. Another review in The Guardian acknowledges that while there is an attempt to portray the gazer as the gazed by various colonised peoples, such as Nigerian carvings of European officers, these were “shoved together” with other ethnographic artefacts “as if they were all imperial relics in a junk shop,” bemoaning the lesser exposure given to these perspectives. By giving greater heed to these perspectives, the Gallery attempts to destabilise the focus. How far the exhibition consistently asserted the challenge that it seeks to make is another matter. In a panel conversation on the exhibition held on 12 January, Third Text Forum on Artist and Empire: (En)countering Colonial Legacies, LASALLE College of the Arts provost Venka Purushothaman and Goldsmiths University Visual Arts Professor Janet Jeffries agreed that the Gallery’s response to the Tate’s show was “too polite, too soft,” and that it could have made a more forceful and outspoken point. In including diverse works from former colonies, the Gallery’s show does argue for a more plural perspective on historical events, but where it falters is in taking a strong stance against the injustices wrought by imperial rule. The exhibition’s desire to ‘examine the impact of Empire on the rise of modern art in former colonies’ resulted in curatorial choices that presented a formal and formulaic symmetry with the works from the London exhibition. Grand portraits of Frank Swettenham were set alongside similar style portraits of local luminaries and historical figures, for example. This limited the space, in all senses of the word, for more robust engagements that made visible the compliance that art and artists built in colonial subjects. Moving through the works, only so few felt like responses to the imperial legacy. It was these few strong contemporary works I gravitated to the most; their irony and retort were resonant and I felt I was listening to artists talking in their own voices, rather than the empire talking about itself through its artists, like a ventriloquist. Amongst them, Michael Cook’s Undiscovered, Yee I-Lann’s Study of Lamprey’s Malayan Male I & II, Andrew Gilbert’s British Infantry Advance on Jerusalem, The Singh Twins’ enTWINed (the latter two were also included the Tate show). These are examples of works that succinctly interrogated the colonial gaze. I enjoyed Australian artist Cook’s photo series, portraits of aboriginal Australians in colonial-style costumes and Union Jack flags mimicking British rulers, in colour, against a greyscale background of the natural landscape. 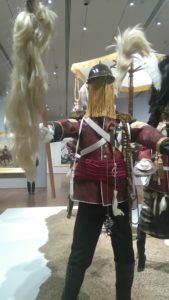 Gilbert’s lifesize installation, in the centre of the third room, caricaturised British soldiers in order to subvert exoticised perspectives on colonial subjects that tend to be evident in ethnographic objects from Western museums. The soldiers were adorned with feathers, blonde wigs and leather stilettos. Andrew Gilbert, ‘British Infantry Advance on Jerusalem, 4th of July 1879’, 2015, mixed media, dimensions variable. Collection of the artist. 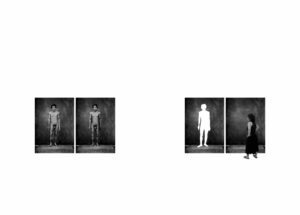 Yee I-Lann’s diptych derived from photographs of a Malayan man by the ethnographic photographer JH Lamprey, who used such an image to create a method to distinguish racial differences by body measurements. In the original, the Malayan man is unpoised, his gaze diverted. Yee remodels him to glower straight at his viewer, fists clenched. In the second panel she then speaks against the prevailing mentality in postcolonial Malaysia of “indexing identities,” by removing the man from the photograph, and pictures herself facing disdainfully this empty silhouette, considering its insufficiency. Yee I-Lann, ‘Study of Lamprey’s Malayan, Male I & II’ (2009) digital print on paper, 60 x 42 cm. Image courtesy the artist and Silverlens. The Singh Twins’ work is a miniature painting reinterpreting Henry Nelson O’Neil’s 1858 Home Again, to which it is placed opposite in the gallery. O’Neil presents the British soldiers returning home from India after its first war for independence in 1857, focusing on their heroism, pride and the relief of survivors and their families; the Singhs depict, in the same style, the plight of Indians who fought in the same war. 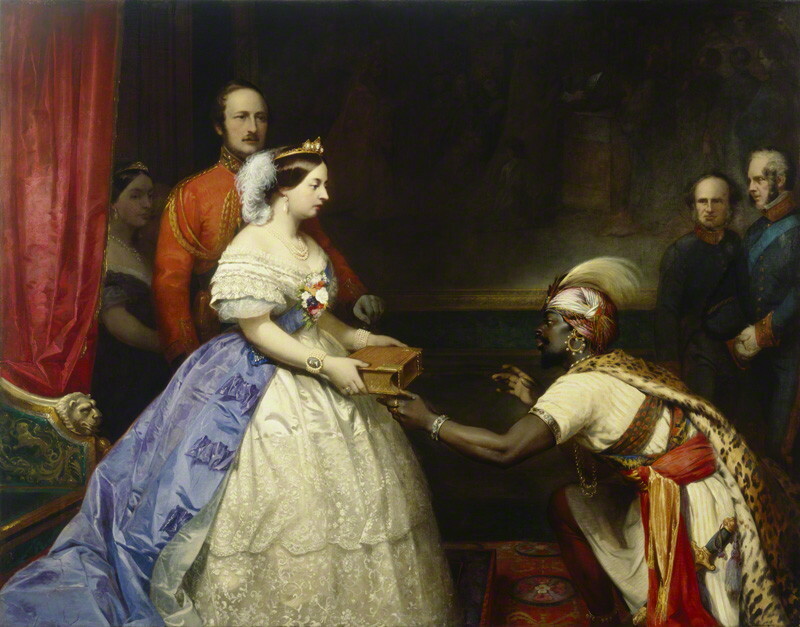 Every war has two sides, and the Singhs aimed to bring to light that of the Indians, whose experiences of oppression and struggle for independence were scarcely represented in Victorian art. In addition, the painting highlights aspects of contemporary Western culture that glorify Indians (such as Indian celebrities on the cover of Western magazines) or Indian culture (such as bhangra on Britain’s Got Talent.) It makes a clear message that while Indian culture is now a well-integrated and well-regarded part of British social fabric, there’s a stark lack of acknowledgement of the legacy of oppression between the two countries. Two other notable works from two contemporary artists were special commissions for this exhibition – Singaporean Erika Tan’s The Weaver’s Lament and Malaysian Wong Hoy Cheong’s new installation version of his video work Re:Looking (2002-2003) specially extended to situate his original piece within a setting constructed from remnant architectural parts from the Gallery’s buildings. The video is a fictional documentary speculating an alternate history where Malaysia had colonised Austria. 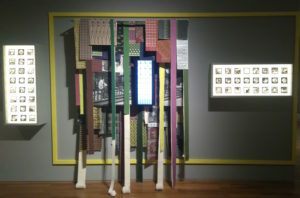 Re:Looking 2002–2003 (with a simplified installation in collaboration with National Gallery Singapore, 2016). Image credit: Wong Hoy Cheong. Erika Tan’s The Weaver’s Lament is a poignant tribute to Halimah Binti Abdullah, a Malayan weaver whose craft was featured, among 19 other Malayans, in the 1924 “British Empire Exhibition” in London. While working and exhibiting at the London exhibition, Halimah died of pneumonia and was buried there. Tan’s work features original textiles Halimah used, which had been in the collection of the Victoria and Albert Museum, interspersed with pictures from the pavilion where Halimah displayed her craft at the 1924 exhibition. It is part of Tan’s ongoing project, Halimah-The-Empire-Exhibition-Weaver-Who-Died-Whilst-Performing-Her-Craft, which explores what is known of Halimah’s life through a range of events, artworks, talks and discussions. Most other contemporary works, though placed face-to-face and on the same level with the older ones, failed to assert confrontation. Akin to Lee Wen’s raised platform, it is just a gesture offering a shift in perspective, but little argument. Is gazing back at centuries-old grandeur enough? The exhibition would have made for a more emphatic and provocative response if its approach came from the position of the affected peoples themselves, who have by now established their sovereign identities. Less an annotated “Artist and Empire” and more “The Empire Strikes Back”, so to speak. The focal point of the Gallery’s show is still the empire; the responses from members the former colonies are marginal to that locus. This, ultimately, only re-establishes the British perspective as the dominant narrative. The Gallery’s spinoff of the Tate’s exhibition points to an inability to subvert the gaze of the colonial, and to assert a unique and independent perspective. Perhaps this inability to subvert the Western gaze comes from an inability to recover from it, amongst institutions, such as state galleries that, in themselves, appear to replicate central hierarchies of cultural value and power. The shortcomings of “Artist and Empire” show that it is this colonial legacy that urgently deserves its own critical and artistic examination. “Artist and Empire: (En)countering Colonial Legacies” runs until 26 March 2017 at the National Gallery Singapore. For more information, visit the Gallery’s website here.